International Marine Publishing, 9780071804981, 240pp. The captivating saga of the September 11th boat lift, when ferries, dinner boats, and other vessels spontaneously converged to rescue nearly 500,000 stranded people from Manhattan "A waterborne evacuation larger than Dunkirk--in New York Harbor? How come we barely noticed this at the time, and have largely forgotten about it since? Readers of this fast-paced book will not forget it again. Jessica DuLong brings this extraordinary episode to vivid, poignant life, using both literary and maritime expertise." --Adam Hochschild, bestselling author of King Leopold's Ghost "In this beautifully written and compassionate account, infused with dread and wonder, DuLong delivers meticulous reporting, human-scale and panoramic, that reframes 9/11. This enheartening chronicle of endurance and kindness, as wonderfully engineered and brilliantly executed as the waterborne rescue itself, proffers an evidence-based and hopeful view of humanity." --Mark Kramer, Founding Director, Nieman Program on Narrative Journalism, Harvard UniversityWhen terrorists took down the Twin Towers on September 11, 2001, frightened people crowded along the shores of Lower Manhattan. With the dust and fires spreading, no one knew if more attacks were coming. Chaos reigned. 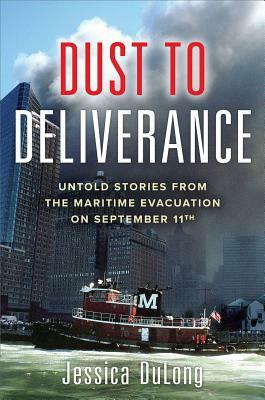 Dust to Deliverance is the gripping story of how the New York harbor maritime community converged spontaneously to deliver stranded commuters, residents, and visitors out of harm's way. Even before the Coast Guard called for "all available boats," ferries, charter yachts, dinner boats, tugs, and other vessels had raced across New York harbor to pick up passengers. In less than nine hours, they rescued nearly half a million people from Lower Manhattan, making this the largest waterborne evacuation in history. Rooted in eyewitness accounts and written by a mariner who served at Ground Zero, Dust to Deliverance interweaves the personal stories of people saved that day with those who saved them, while revealing the inner workings of New York harbor and its close-knit community. This groundbreaking, minute-by-minute chronicle provides an unprecedented look at one of the most significant moments in American history. This human saga of compassion, triumph, and resilience reveals how tragedy creates new, often unlikely, alliances, even as it strengthens existing bonds. The book brings to light the resourcefulness and resounding human goodness that rise up in response to darkness, calamity, and turmoil. Journalist and historian Jessica DuLong is the author of My River Chronicles: Rediscovering the Work that Built America, winner of the American Society of Journalists and Authors Outstanding Book Award for Memoir, 2010. Her writing has appeared in Newsweek International, Rolling Stone, Psychology Today, Newsday, and Maritime Reporter & Engineering News, among other publications. A Coast Guard-licensed merchant marine officer, DuLong serves as chief engineer of retired 1931 New York City fireboat John J. Harvey, a historic preservation project now operating as a living museum, which was called back into service on September 11.